Wow what a hectic summer – the long warm days allow us all to pack so much in and of course the school holidays mean that every day is a busy one. By September I think we’re all ready to get back to a little bit of routine, even if it’s a school or work one! As we move into autumn, our rhythms naturally want to slow down. We might need more sleep, crave heavier food or prefer yoga to running as the nights get darker and sunrises bring the freshness of autumn. I've been searching for ways to nurture and maintain my creative energy in the dark evenings ahead. I spend all day thinking at full tilt about my business, the house, my family or the 1001 other thoughts that vie for attention and it strikes me that after a hectic summer I need to take heed of natural rhythms, make time to rest my left brain from thinking and give my right brain some freedom to be creative. Creativity can be wonderfully therapeutic, helping the brain to come to a place that's still, present and relaxed. Mindfulness is a practise that is close to my heart and helps keep me balanced, so using drawing as a mindfulness practice makes perfect sense. But sometimes it's hard to be mindful. Sometimes my monkey mind won't sit still for a second. However, I think I've found something that might just quieten down the monkey! 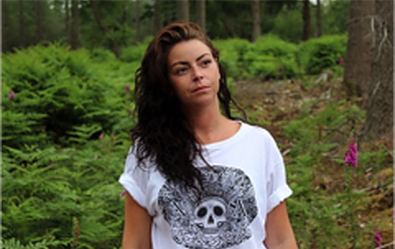 At an event this summer I met the lovely Laura of Nomadic Array, who was creating some amazingly powerful designs, and what particularly struck me was her calm focus on her work and her art. Intrigued, I asked about her techniques, we got talking and she introduced me to the amazing and hypnotic art of Zentangle. 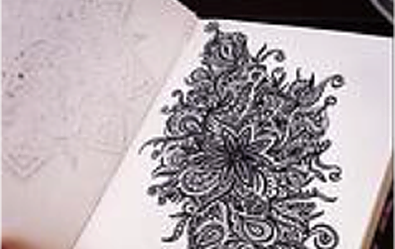 She tells me that it's an art she's perfected in just a few years, and assures me that anyone can create a Zentangle. Described as a form of 'artistic meditation', Zentangles are miniature pieces of abstract, black and white art. It sounds a little crazy but it really took a lot of courage to begin my first design. My inner critic was in full flow with lots of negative self-talk like "Mine won't look like the ones I've seen", "I won’t be any good", or "I just can't draw; I'm wasting my time!" When I finally picked up the pens, I happened to be wearing our Amity 'courage' bracelet as it matched my dress that day. When I looked at it I remembered that we’d carefully designed it as a piece of mindfulness jewellery, and that I should be using it at that very moment to inspire a little courage and self belief. If you look closely at the bead you’ll see it’s engraved with a pretty thyme flower motif; thyme has been associated with courage for millennia. As I contemplated our thoughtful design, and the meaning and symbolism of the thyme flower, it struck me how much the delicate pattern reminded me of some of the intricate designs I've seen in Zentangles. Just the confirmation I needed to put my pen to work, reach for some courage inspired by thyme, and give my brain (and inner critic) a much-needed rest! Now I've drawn a few my confidence has really taken off and I'm contemplating turning my Zentangles into beautiful cards for friends. Why not join me and build up a selection of images to give as Christmas cards through the autumn evenings? You might like to include the Amity bracelet or another suitable piece of our mindfulness jewellery as a gift to go with your card, as encouragement to a friend to dig deep and find the courage to live life in a way that's true to her own beliefs and dreams. Our Braveheart Talisman is another piece of thoughtful jewellery that symbolises courage, inspired by a fennel seed and designed by Catherine Tutt.